The hop season is upon us! Hop downy mildew is currently the biggest pest of concern for Northeastern hop growers. Downy mildew overwinters in the hop crown and primary inoculum will be released from the first shoots. 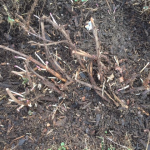 Removal of the first flush of spring hop growth is called “scratching” or “crowning” depending on how far down a plant is cut. Shoot removal is used as an early season preventative measure against downy mildew and as a way of managing harvest time. Hop plants have been budding out for a few weeks now in Vermont. 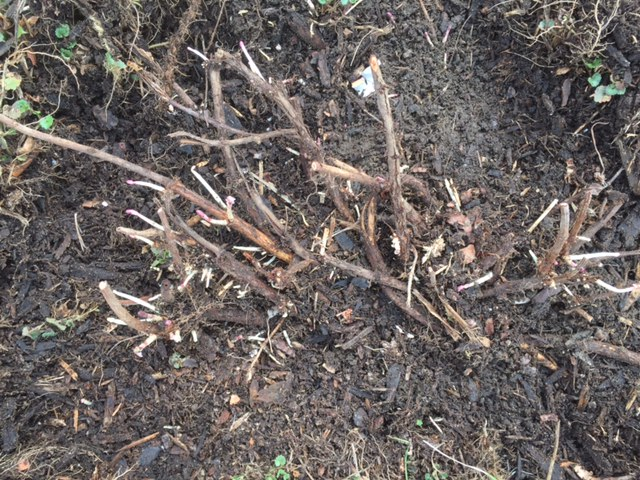 1st year hop yards should not be crowned to allow for root establishment. 2nd year hop yards should be crowned if downy mildew was a problem last season. 3rd year hop yards should be crowned. 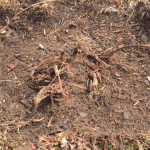 One of the following three methods can be used to kill back the top 1/2-1 inch of each plant. 1. Mechanically cutting (Figures 1 and 2). 2. Flaming. 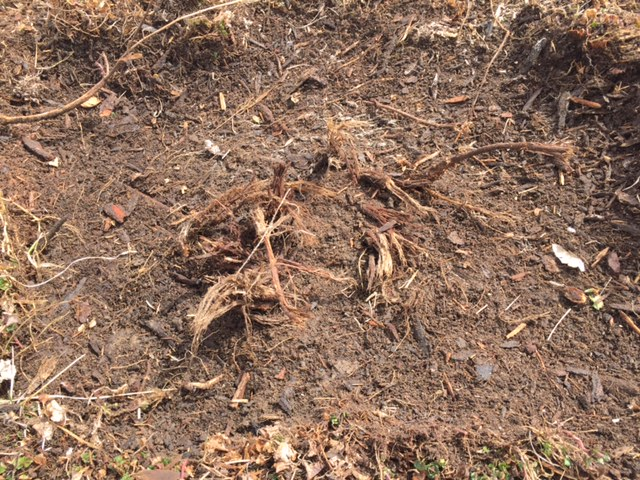 It has been DRY so please be careful not to burn down your hop yard. 3. Herbicide application. Make sure any pesticide used in your hop yard is labeled for use in your state and on hops. The goal of crowning is to manage disease but also to make vegetative and reproductive growth consistent across the yard and from season to season. In our 2014 crowning date study we found that there was no difference in hop quality or yield between plants cut back on April 14th and May 12th. Hop plants cut back by 5/9 will be able to reach the top of the trellis by June 21 when the plants enter their reproductive growth stage, assuming the plants have sun, water, and nutrients. In this video, Dr. Heather Darby describes what downy mildew is, and some warning signs to look for when evaluating your hop plants. This entry was posted on Monday, May 4th, 2015 at 12:22 pm and is filed under What's Hoppening. You can follow any responses to this entry through the RSS 2.0 feed. You can leave a response, or trackback from your own site.